The College Code of Practice includes an access and equity policy. This document is available on request. It is the responsibility of all staff to ensure the requirements of the access and equity policy are met at all times. IESC recognises that differences can arise from time to time between students and the College. IESC will try to solve all student complaints and appeals as quickly as possible. What is a complaint? A complaint is when you say (or write) that you are unhappy, frustrated or dissatisfied with the quality of a service you receive, something that another person has done or the way something is done. What is an appeal? You make an appeal, usually to someone in authority, if you want them to change a decision they have made. Step 1: Speak to someone, for example, if it is about your course, start with your teacher; if it is about your record of attendance, talk to the Student Service Officer. Step 2: If you still have a problem, speak to the Director of Studies. You may bring a support person with you. If you want to make an appeal, or, for example, you have received an attendance warning letter, you should speak to the Director of Studies first. The Director of Studies will respond to your complaint or appeal in writing within 10 working days. 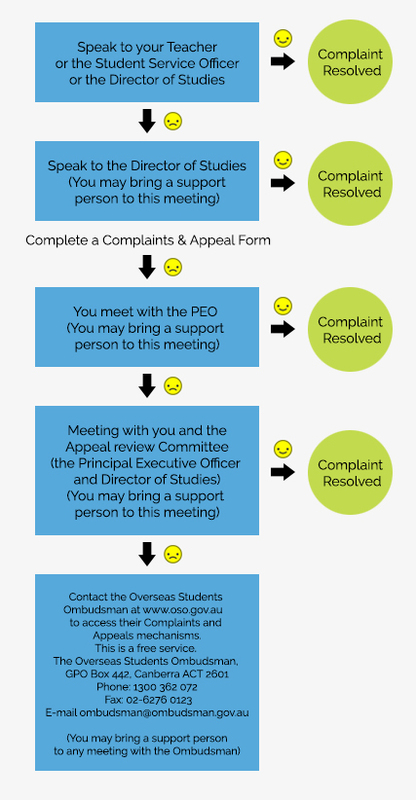 Step 3: If you are not happy about the way your complaint (or appeal) has been dealt with, you should complete a Complaints & Appeals Form and make an appointment to speak with the Principal Executive Officer (PEO). You may bring a support person with you to this meeting. The PEO will respond to your complaint or appeal in writing within 10 working days. Step 4: If you are still not happy about the way your complaint or appeal has been dealt with, you should ask for a meeting with the Appeals Review Committee. You may bring a support person with you to this meeting. The Appeals Review Committee will respond to your complaint or appeal in writing within 10 working days. Step 5: If you are unhappy with the outcome of the Appeal Review Committee, you can ask for the help of an external appeals agent. The Overseas Students Ombudsman offers a free service to overseas students who wish to lodge a complaint or appeal. Contact the Overseas Students Ombudsman at www.oso.gov.au to access their Complaints and Appeals mechanisms. You should go to the ‘Making a Complaint’ link on the overseas Students Ombudsman’s website to find information and an online application form if you wish to use Student Complaints process. You may choose your own external student appeals agent if you wish. You should inquire about current fees when you contact the agent. Handing in assessments markedly similar to or copied from another student. Presenting the work of another individual or group as their own work. Legitimate cooperation between students on assignments is encouraged, since it can be a real aid to understanding. It is legitimate for students to discuss assignment questions at a general level, provided everybody involved makes some contribution. However, students must produce their own individual written solutions. Copying someone else’s work is plagiarism, and is unacceptable. Students must be careful when photocopying the work of others. The owner of the material may take legal action against students of the college if the owner’s copyright has been infringed. Students are allowed to do a certain amount of photocopying for research or study purposes. Generally, 10% or one chapter of a book is acceptable, where the participant is studying with, or employed by, an educational institution. The Student Code of Behaviour requires the following rights and expectation to be respected and adhered to at all times. The expectation that students will submit work when required. The expectation that students will maintain consistent participation by attending all required classes and assessments. The expectation that students will attend all required classes and assessment as part of the requirement to progress through the course satisfactorily and complete the course within the time frame notified on the student written agreement. After the three steps in the discipline procedure have been followed, and breaches of the Code of Behaviour still continue, training services will be withdrawn and the student will be sent a student suspension or cancellation letter. At any stage of this procedure students are able to access the College complaints and appeals procedure to settle student any disputes that may arise. Students who are experiencing difficulties with study must contact the Director of Studies for further assistance. We have a homestay provider to cater for a wide range of budgets but with safety and comfort as the foremost concerns for our students. Our multilingual Student Services & Administration Manager has extensive knowledge of IESC programs and services, as well as other educational and vocational pathways. Students are assisted to see ‘the big picture’ and, if need be, are given help or advice general health related issues, personal problems, and referral to other services such as legal, medical & etc. Students requiring special or intensive assistance must contact the Student Services & Administration Manager who may refer them to external support services if required. These services provided with no additional cost to the student. If the College refers the student to external support services, the College must not charge for the referral. Students who seek additional individual support may contact the Director of Studies for further assistance.